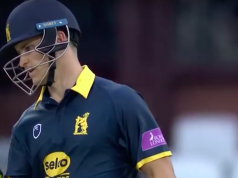 Having been hammered for 229 runs off 20 overs by the Leicestershire Foxes on Friday evening, the Birmingham Bears conceded 220 runs to the Durham Jets and, after a valiant run chase, fell 18 runs short. When Sam Hain and Colin de Grandhomme put on 110 in just 50 balls, a miracle looked possible. De Grandhomme hit four consecutive sixes off Imran Tahir. Hain, who had, for him, started scratchily, went into overdrive in the second half of his innings, reaching 95 off just 53 balls with seven fours and five sixes before perishing to a catch at deep mid-wicket off James Weighell. When Grant Elliott was caught at long on in the same over, the Bears’ chances all but disappeared. Weighell will no doubt have been greatly relieved, having dropped de Grandhomme early in his innings, a real sitter at long on. De Grandhomme battled on to the end of the innings, his 63 coming off 33 balls with four fours and five sixes. But the 35 needed off the last three overs was just too much and the Bears’ effort ended with a whimper rather than a bang. In all truth, the task was already mammoth when Hain and de Grandhomme came together at 59-3 in the 8th over. Ed Pollock had contrived to hit the second ball of the innings, from Will Smith, to straight to Davies at deep square leg and both Ian Bell and Adam Hose flattered to deceive. Liam Trevaskis dropped one chance from Bell but redeemed himself with a catch at mid-off and Hose skied to deep cover to give Smith his second wicket. As can be gathered from the scores, groundsman Gary Barwell had produced a belter of a pitch. The sun was shining and a light breeze blowing. Durham clearly made the right decision in batting first. Tom Latham and Graham Clark gave the Jets the kind of start they have been missing in the Blast so far. Clark, in particular, showed imaginative footwork and a well-organised armoury of shots. Their half-centuries tripled the number of fifties scored by the Jets in the Blast this season. The opening stand reached 126 before Latham was smartly caught at short extra cover by Dom Sibley off Grant Elliott who also claimed James Weighell to a long off catch in the same over. When Trevaskis fell to the persevering Ollie Hannon-Dalby and Elliott dismissed Clark for 65 off 40 balls Durham looked to be wobbling at 138-4 in the 14th over. Unfortunately for the Bears, their bowling was toothless enough to qualify for an appearance on the Jeremy Kyle show. Paul Collingwood and Will Smith were able to steer the score well over 200, with 82 coming off the last 6.3 overs. They both fell before the end of the innings. But even on this pitch, 11 runs an over was always likely to be beyond the Bears – and so it proved. Durham have now won two and lost two in the Blast whereas the Bears, after their grim weekend, have lost three and won two. For them, qualification for the knock out stages is beginning to look like a distant objective.